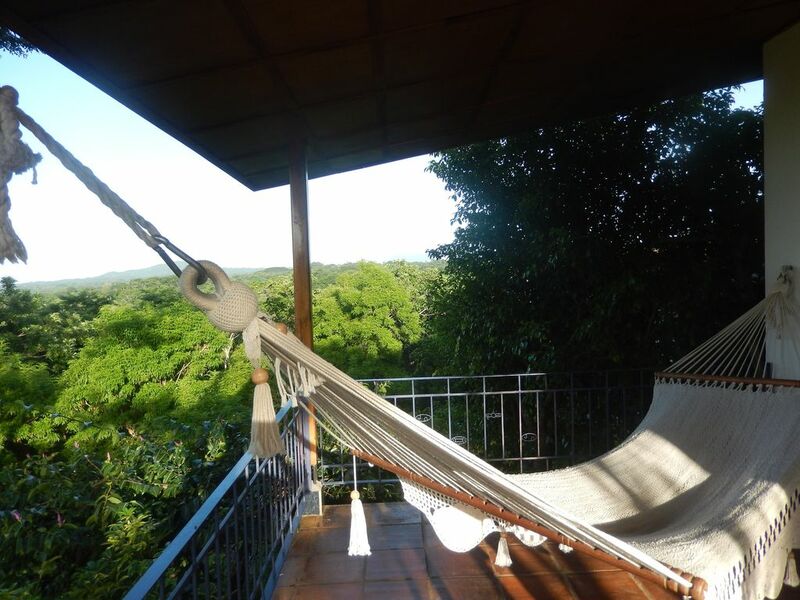 Villas Vista Masaya is a small bungalow that is managed by the Dutch couple Joop Hakvoort and Nel Verbree. They offer you a private home where four people can live. The four bungalows have two bedrooms with two single beds, one bathroom with hot shower, a separate toilet room and each with its own spacious terrace over the full width of the house with a hammock and rocking chairs. You can also place your table outside if desired. The houses are spacious and equipped with all the comfort you desire. The site is 2 km away from the town of Masatepe along an unpaved but always accessible road. There is free WIFI in the bungalow, but also by the pool. Only the guests on the property make use of the swimming pool. You will receive an extra towel in your linen package. Your beds are made upon arrival and you can change your linen. You can also have the laundry done for a fixed fee. You can also have your house cleaned for a fixed fee, but you can also choose to do it yourself. You will be amazed about nature and tranquility here, but also the pleasant climate because of its location at 450 meters altitude. We hope you feel at home quickly. At night you can see the red reflection of the volcano Masaya, but also the silhouette of the volcano Mombacho. you will find many restaurants and souvenir shops Masatepe and most other "white villages" of the plateau. Your own covered terrace has a beautiful view, but also by the pool and in many other places on the property. We grow coffee and many fruit trees. You can always pick fresh fruit from the trees, such as mango, citrus fruits, but also the lesser-known fruits such as the nancite. Additionally filtered water, towels, sheets and free Wi-Fi. The Dutch managers live in their own house in the park and are always available to answer your questions about the park, the surroundings or the day trips you want to make to discover Nicaragua. There are two smaller bungalows for two people and two houses for permanent rental. You can think of the arts and crafts market in Masaya, the two volcanoes Mombacho and Masaya (which you can see from the park), the virgin beach of Boquete or the colonial city of Granada. On Sundays you'll find many Nicaraguans from the capital on the road from Masaya to the white villages. They cool down, buy a gift from one of the stalls along the way and have lunch at one of the many restaurants. And on feast days there is even a file to the crater lake Apoyo, because people want to swim there. It is relatively easy to take a bus or taxi in the town of Masatepe. The tuctuc (mototaxi) passes the park and in your folder in the bungalow you will also find the telephone number of the taxi with the rates for the various trips. It is an alternative to renting a car. The price from the airport in Managua taxi ranges from $ 40 to $ 50, depending on the number of people. The last kilometer is a dirt road and a higher car is more comfortable here. The place is hard to find. That is why we advise everyone to first contact us so that we can pick you up from the central park at the Catholic church of Masatepe. You can have your house cleaned by Flor for an additional amount. We had a great experience there! Place matched our expectation and it was exactly like how the vrbo overview had described the home. Nel took great care of us. We are a family of 4 with 2 kids(5 and 9 years) old. It was peaceful retreat overlooking the Masaya lake. The kids had a blast there! , Kids did a lot of fresh fruit picking, running around the trees. Nel even got us fresh coconut water. We lazed around in the hammock enjoying the view, took hikes. Kids had a good swim in the pool. Nel was very friendly and took care of us right from arranging the taxi, recommending touristic spots. She was always on time and helpful! If you do not know spanish, would recommend getting a taxi from Nel. The taxi driver was reliable and stayed with us the whole day! Would definitely recommend this place, especially for families with kids. Thank you very much. It was so good to see how the kids enjoyed the space. To see them looking for natural materials to play with. Thank you for mentioning our taxi driver. He can show you details and tell you where you can have a drink or where the restaurant is you prefer. He protects you like his own family. It was good to see that you enjoyed to see a lot of highlights during your stay of almost a week. And not having your hired car you might even think about taking a walk to town and see more about daily life of people and nature. Thanks Ruth and James. Every stay more means more possibilities for development. Good tip to purchase your own food before arrival. You will find the basic supermarket Pali in Masatepe and the more luxury supermarket Colonia in Masaya and Jinotepe, as the most close to Masatepe. And soon we will have our own coffee, medium toasted. Vier weken verbleven wij van half februari tot half maart op het complex Villa Vista Masaya, waar onze gastvrouw Nel en gastheer Joop een hele hoop bijdroegen aan ons vakantieplezier. Een schitterend landgoed, puur natuur, met daarin 8 mooie ruime bungalows, afwisselend voor 2 of 4 personen, stond tot onze beschikking. Iedere bungalow had een prachtig uitzicht op het meer en de vulkaan bij de stad Masaya. En wat ik als huisvrouw het fijnste vond: op verzoek kon onze bungalow tegen een kleine vergoeding wekelijks schoongemaakt worden. Echt vakantie dus! We hebben heerlijk gerelaxt op onze overdekte veranda en vaak gezwommen in het mooie zwembad. De goed ingerichte keuken daagde ons steeds weer uit tot het maken van lekkere en gezonde maaltijden. En iedere ochtend versgeperst sinaasappelsap van zelf geplukte sinaasappels uit de boomgaard bij het ontbijt en biologische koffie van het bedrijf, klasse! En dan het weer: iedere dag tussen de 25 en 30 graden met een verkoelend windje, wie wil dat nu niet? Hadden wij vragen dan stond vooral onze gastvrouw Nel altijd voor ons klaar met goede raad of handige tips voor bijvoorbeeld leuke uitstapjes. Onze reservering voor volgend jaar gaan wij nu al maken, dus Nel en Joop: tot volgend jaar. Voor ons de 2e keer dat we hier onze dagen in Nicaragua hebben doorgebracht nu voor een langere periode (3 weken). De bungalows liggen in het buurtschap Nimboja op een paar minuten rijden van het stadje Masatepe (waar je boodschappen kunt doen). De bungalows zijn eenvoudig maar goed ingericht. Je kunt je eigen eten koken in het keukentje. Er is geen airco in de bungalow, maar dat is door de ligging ook niet nodig. er staat altijd een fris windje. Onze bungalow lag op een helling met het terras/veranda richting het kratermeer, waardoor je een prachtig uitzicht hebt op Masaya. Op het terrein zie je vele verschillende vogels en andere dieren. Je hebt het gevoel dat je in een volière wakker wordt, met al die prachtige vogelgeluiden. -Laat je door de eigenaren ophalen in Masatepe wanneer je er voor het eerst komt. De eigenaren zijn niet verantwoordelijk voor schade of verlies van persoonlijke eigendommen. Het verblijf is op eigen risico. In het huisje is een inventarislijst. We vragen u deze te controleren om misverstanden te voorkomen. We vragen u door te geven als u nog iets extra's wenst. Bij late aankomst kunnen we in overleg alvast een paar boodschappen voor u doen. De kosten daarvoor kunt u de eerste dag van aankomst vergoeden.